1919A4 Mount, For shooting in a standing position. 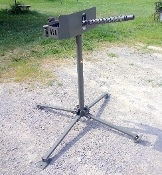 Uses a standard 30/50 pintle or with the ammo link tray as pictured. Price is for the mount without the link tray, you can add that as a option, or with a pintle. The mount has the socket welded in, and does not include the pintle or link tray. These are made to order, Comes painted in OD green or flat black, please allow 1 to 3 weeks build time before it ships, sorry its just me that does it all, and I am getting slower and older.